The best little car corral in Arizona. Many people who flock to the American southwest after developing environmental illness have no idea that car camping or parking in rural areas will leave their car vulnerable to damage from local critters like mice, rats, squirrels, and rabbits, to name a few. During nesting seasons, these animals will seek out the dark, protected, relatively insulated areas of a car (e.g. under the hood, in engine) in which to build nests for their young. Many a morning when I checked under my hood, I found squirrels, rabbits, and mice just hanging out in the engine. I have removed several nests made of sticks, string, and found materials from the engine area. I have had to have wiring repaired where rodents have chewed through on the wires to my air conditioner fan and other areas on three separate occasions. Not only is this annoying, inconvenient and expensive over time, but it is also dangerous — both for the animal and you! A neighbor of mine once had their car explode into flames as they were driving because the wires on the their brakes had been destroyed by rodents. Luckily they were able to pull over and slow the car down in time to jump out. The average person who finds themselves with a rodent problem in their vehicle will usually just put some dryer sheets in the area or some peppermint oil and call it a day. But those who are chemically sensitive have to get more creative than that, as we can have severe physical reactions to all the typical solutions. One environmentally sensitive friend of mine recommended I get a mechanic to close off all openings to the car engine using grating and metal sheeting. Depending on the car, that could get tricky and for some of us, it is difficult to find a mechanic to work with that won’t contaminate our car in some way. I tried leaving my hood open at night as others had advised, but some nights it was just way too windy to do that. I even ordered some coyote urine to sprinkle around my car to ward off small animals, but I reacted terribly to the strong scent and had to abandon the idea. Before shot: The original car corral site. There may be other materials I am forgetting or unaware of since I did not build it myself. 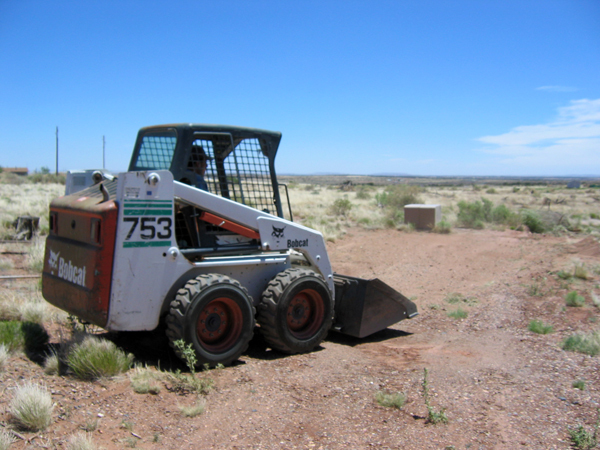 The person you hire should be able to determine all hardware needed. I worked with a local handyman named Walt who is a skilled craftsman and metalworker. 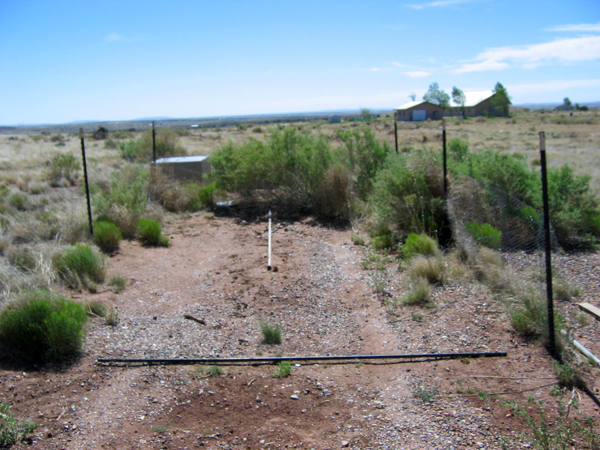 First we determined how big the corral would be based on my car’s outside measurements. We decided on 12 feet x 20 feet for the overall dimensions. I wanted to be able to open the doors on both sides of the car at once and have a few feet in the front and back for clearance. Once you know the overall dimensions, you can figure out the quantity of materials needed and place your orders well ahead of time. 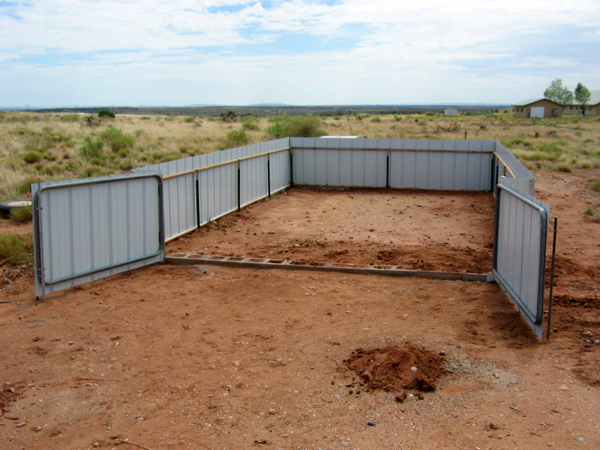 Since I was building a 12′ x 20′ car corral, I needed approximately 64 feet of metal sheeting. 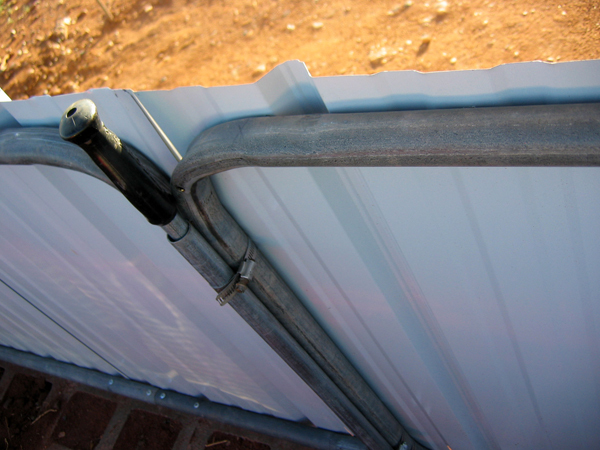 The metal sheeting comes in heights of 4 feet; that would provide enough clearance for 1 foot below ground and 3 feet above ground. I also needed to purchase fence posts and the frame for the front gate. The rest of the materials (hinges, screws, bolts, etc.) were provided by Walt, who charged me for them in his fee. Depending on where you purchase your materials, there may be a several week wait so be sure to factor that lead time into your schedule. 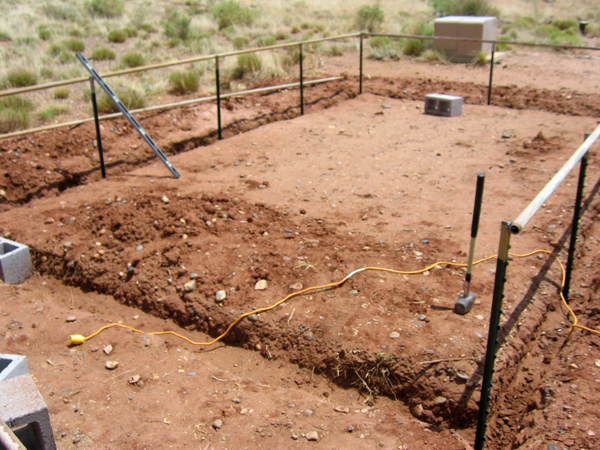 Next I had to measure out the dimensions of the corral and mark the areas before digging. Once you layout the sides with a tape measure (I used a stick to draw the rectangle out in the earth), you’ll want to measure on the diagonals to insure 90 degrees angles on all sides. Then came the fun part: digging trenches 1 foot deep by about 3 inches wide around three of the four sides of the car corral. I tried digging them myself to save money but ended up having to hire someone with muscle to finish the job. I wet the area with a hose the night before and morning of to make the digging easier. 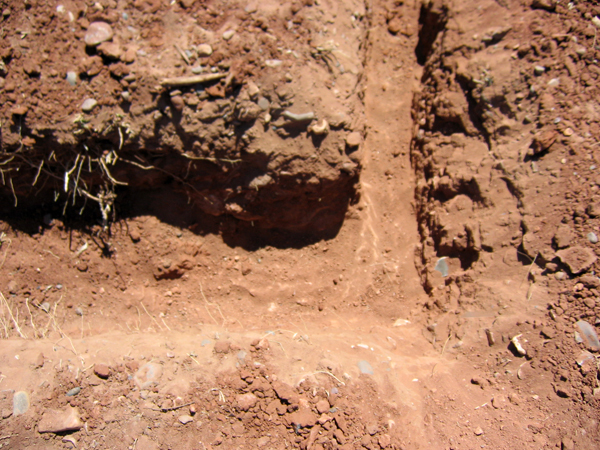 Different widths for front and side trenches. 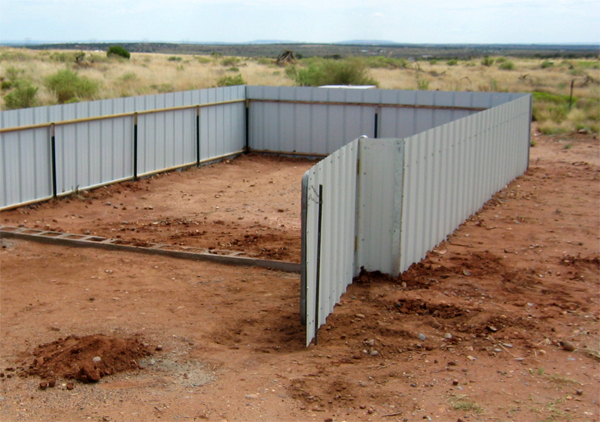 The way Walt decided to do the front gate required that we dig a wider, more shallow trench in the front than for the sides and back of the corral. 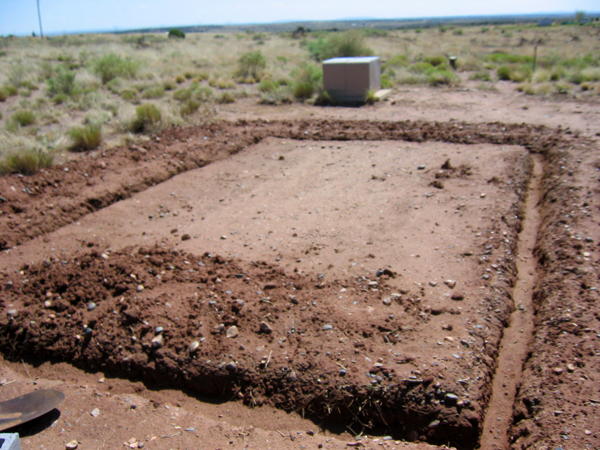 The front trench had to be about 6 inches deep and 14 inches wide – deep and wide enough for large cement bricks that would be placed along the front rim, filled with concrete, and then covered with dirt to prevent the rodents from burrowing in under the gate. Putting posts and connecting pipes in. After digging the trenches, Walt then pounded in posts on all corners and along the sides. Then he connected all the posts with pipes he scavenged from our property (we found them just laying around from a previous job) to create the framework for the metal sheeting. The pipes had to be cut to fit on site. Once the corral framework was up, Walt focused on the front gate, filling the buried bricks with concrete, and putting in the posts for the gate to swing on. 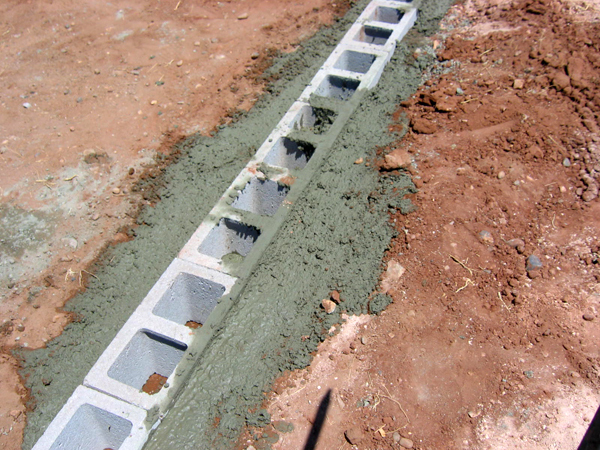 Concrete being poured in and around the bricks. 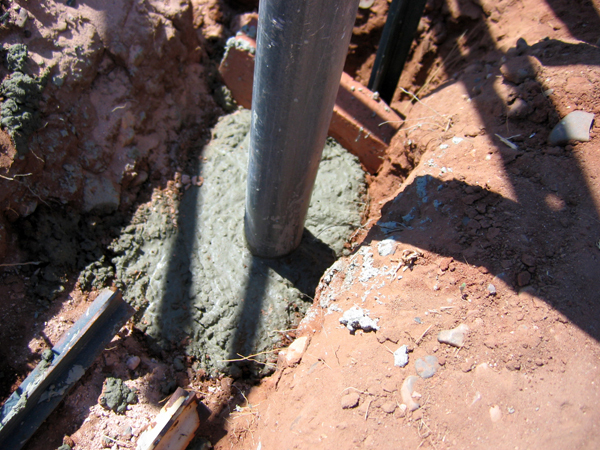 Concrete being poured around gate posts. Hinging the pre-fabricated gate frame. 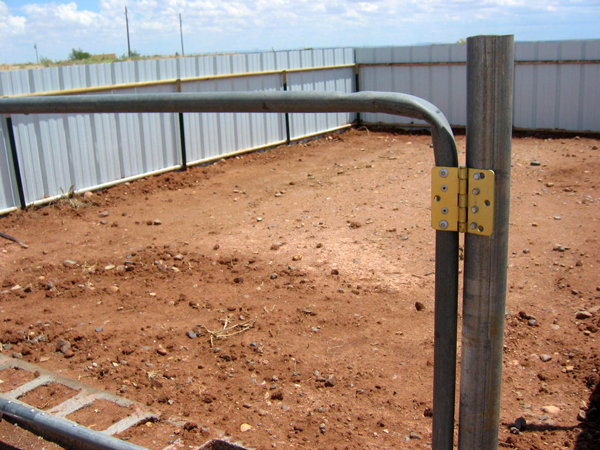 Once the frame for the corral and front gate are assembled, you can then attach the metal sheeting to the piping. I chose metal sheeting to match the color of the garage and shed to keep it color coordinated with the accessory buildings on the property. 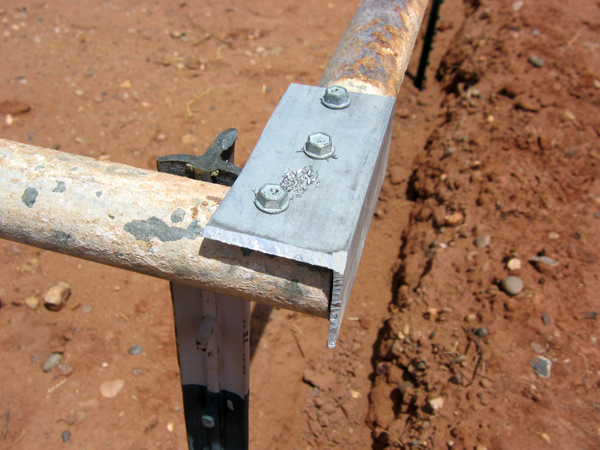 When the metal sheeting is in place, you can then refill the trenches with the surplus dirt on both sides of the metal, tapping the dirt down with the back of the shovel to create a flat, even surface. Finished car corral with gate open. Chain and pole for keeping gate in “open” position. This car corral is really a work of art in how well it is constructed and how well it keeps critters out. I am so thankful for Walt’s ingenuity and attention to detail. He is a real pro at figuring out ways to avoid using solvents, glues, and other chemicals to get the job done for those of us with chemical sensitivities. I hope my sharing this will help others to build their own car corrals and save their cars from rodent damage. 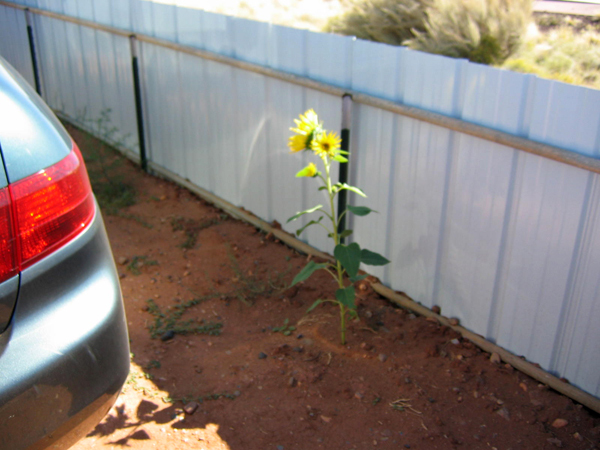 A few weeks after the car corral was completed, a sunflower began to grow. Somehow, it seemed symbolic – nature’s way of blessing my new car home. 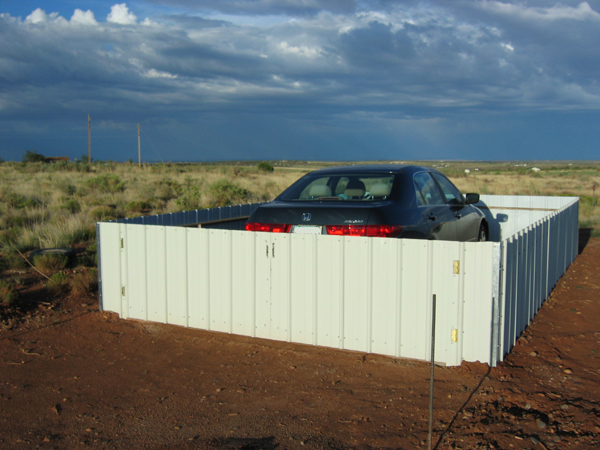 Disclaimer: The above materials, costs, and steps taken to build this car corral are approximations and should not be taken literally. 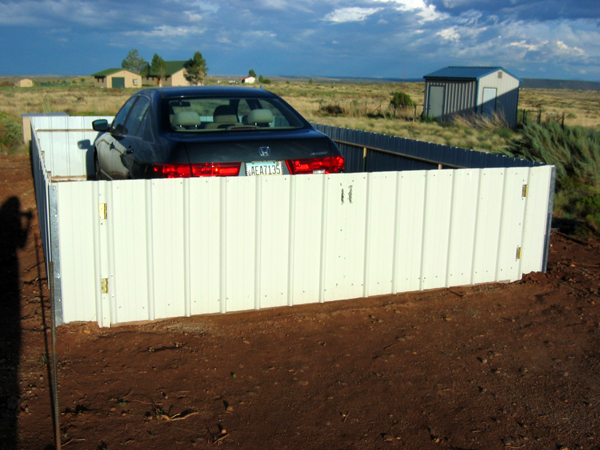 If you decide to build your own car corral, please work out all details with the person building your corral. My article should be used as a guide or for inspiration only.